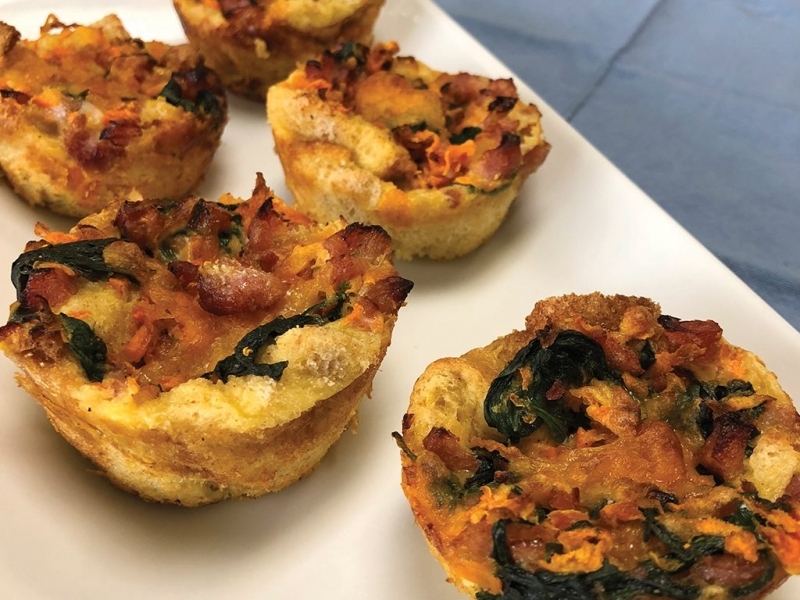 These savory bread pudding muffins are not only delicious, but provide a variety of important micronutrients like vitamin A, vitamin K, folate, and calcium. They also contain dietary fiber which helps with digestion, and along with protein and fat, promotes fullness, making them a great addition to a meal or snack any time of day. Place the spinach into a microwave-safe bowl. Cover the bowl and microwave on high for two minutes. Once the spinach cools, use a paper towel to squeeze out as much water as possible. Add the milk, eggs, butter, and seasonings to a large bowl and whisk to combine. Add the spinach, shredded carrots, and diced ham to the bowl and stir together until all ingredients are well distributed. Spray a muffin tin with non-stick cooking spray. Fill each muffin cup to the top with bread cubes, and then add the mixture into each cup. Sprinkle cheese on top of each cup. Bake the muffins for 15-20 minutes, or until puffed up with brown tops. Let cool.